The in basket: Some months ago, a reader told me she believed the timing of the traffic signals on Highway 305 through Poulsbo was to be reviewed at some point after completion of its widening project and the establishment of the HOV lanes. The Poulsbo City Council has opted for fairly long red light wait times on the side streets to keep the through movements flowing. I didn’t recall ever hearing of such a planned review of the signal timing, but did report back then that the unorthodox placing of the HOV lanes on the outside rather than against the center barrier was to be reviewed at some point – five years after they opened, as I recall. The outside lane was chosen to be the HOV lanes to make it easier for transit buses to get to and from the roadside to pick up and discharge passengers. I asked Andrzej L. Kasiniak, Poulsbo city engineer, what he recalled. And I asked Olympic Region officials for the state Department of Transportation if the HOV lane review had ever been done. The out basket: Andrzej said he was unaware of a council pledge to review the signal timing at a particular time. Steve Bennett, traffic operations engineer for the Olympic Region, replied, “While no formal study was done, we did look at the numbers and types of collisions that occurred within the limits of the HOV lane and the numbers and types of complaints we received about the lane, especially over the last five years. The in basket: Michael Schuyler read the recent Road Warrior column about it’s being illegal to turn right out of Charleston Beach Drive in Bremerton directly into the Highway 304 HOV lane and asked on the Road Warrior blog at kitsapsun.com, “OK. Let’s say you are alone turning right onto a highway where the HOV lane is the right lane, such as SR 305 through Poulsbo. Let’s just say traffic is also heavy at the time. “If you turn right into the HOV lane you are using the lane illegally. If you turn into the inside lane, you violate the “turn into the nearest lane” rule. “Will the WSP give you some slack here, or will they cite you for not moving over immediately?” he asked. The out basket: When that HOV lane opened, the official answer to Michael’s question was kind of vague, saying that turning right into the lane was permissible for a single occupant vehicle if it moved quickly to the general purpose lane. Likewise, moving into the HOV lane was OK to prepare for a right turn off of the highway if you did it right before the turn. If I’m ever in a situation where I take that advice, I’d be careful not to pass any cars in the general purpose lane before moving over, signaling and moving over when a break in traffic appears. 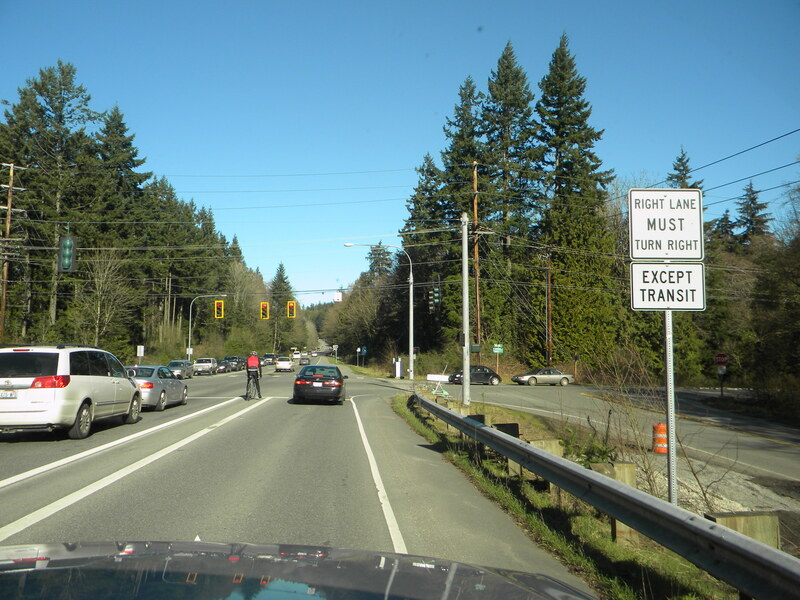 The in basket: Dr. Craig Benson writes, “Perhaps you can help me crack the code of the traffic lights along Highway 305 in Poulsbo. I read in the Sun that as part of the revamping of the 305 corridor the lights were supposed to be timed to provide for smoother traffic flow and less stopping, to save gas. “Since I live off Hostmark and often shop at College Marketplace,” he said, “I have occasion to pass through all six lights in between at various times of the day and night, sometimes with no other traffic interfering, but rarely at rush hours. I’m pretty sure I’ve never made it through all the lights without stopping. “I’ve tried setting my cruise control right at the posted limit, a little higher, a little lower, accelerating faster and slower from the lights, everything I can think of to pass through the lights as timed, without success. The out basket: The state gets this inquiry enough that it has posted a discussion of the limitations of synchronization on its Web site, at wsdot.wa.gov/Operations/Traffic/Signals/signal_coordination.htm. – Pedestrians. Whether those on foot consume some of the time devoted to the various movements affects the amount of time for other movements. – Side streets. Even where through traffic is given preference, such as on Highway 305, making for long waits for a green, the goal is to make sure all cars waiting when their queue gets a green light are served. The number of cars crossing affects the main line timing. – Left turns. The amount of time devoted to them and the number of vehicles waiting to turn subtracts seconds from the main line. – When you drive. Many coordinated system are taken out of synchronization at night and on weekends. I’ve had to abridge the information on the Web site, for space reasons. Look it up for a more detailed explanation. The in basket: Gary Nolta writes, “I travel Highway 305 four or five times a week, and I have noticed that the road is sinking where they have been working with the stream for the fish under the road. “There was no dip there before the work began. It is really noticeable in the south bound lane. Hopefully they will fix it before the contractors leave,” he said. It was noticeable but not alarming when I looked for it on a drive along 305 a while ago. I asked if the office handling the culvert replacement there was aware of it. Why steel, not concrete for Highway 305 culverts? The in basket: Don Hein is puzzled by the material in the new culverts being put under Highway 305 in North Kitsap to remove fish barriers. “I’d like to know why the culverts are made of steel instead of concrete,” he said. “Steel rusts. “Also, the culverts seem to be made of 1-inch thick steel plate. How, where and by whom is such thick steel plate rolled into a cylinder? “You can see one of the culverts close up in the parking lot of the George fireworks stand on Highway 305,” he said. The out basket: Jerry Moore, state project engineer says, it results from having to pound the culverts beneath the highway. “Steel pipe was chosen because it can be driven or pushed through the fill at a reasonable cost. Technically, concrete pipe can be pushed through the fill. However, according to technical reports that I read, special attention has to be given to prevent damage to the ‘brittle’ concrete especially at the joints. Both the technical reports and our contractor said it would cost more to push concrete pipe through the fill. “The pipe is made of 1 and 1/8-inch-thick steel,” Jerry said. “This thickness was chosen by the contractor to handle the driving forces generated from the hammer. Structurally, only 5/8-inch thick steel is required for the load generated by the weight of the highway fill. Jerry didn’t include information on the maker of the culverts, and I didn’t ask again, but there is no shortage of companies dying to tell you about their steel cylinders online. Just Google it. The in basket: Glenda Wagoner, who concedes that she’s the kind of driver who has generated complaints about how she passes (though she says it’s always in a legal manner), thinks there is an explanation of danger on the two-lane stretches of Highway 305 that can be reduced without reducing the speed limit. The state has dropped that limit from 55 to 50 mph between Poulsbo and Bainbridge Island. Even before the announcement of that impending change, she was on the line to me saying there should be more 55 mph signs on 305, because a lot of drivers won’t go higher that 50 or even less. They miss the only sign coming out of Poulsbo southbound raising the limit and keep at the speed they were going while in Poulsbo, she contends. That creates unsafe passing by drivers who know the speed limit and get anxious behind those who stay way below it, she said. Put up more 55 mph signs, she said in her first call. Don’t lower the speed limit, she said in her second. The out basket: Well, says Steve Bennett, traffic operations engineer for the Olympic Region of state highways, more signs she’ll get. But they’ll say 50 mph. “We plan on placing four new speed limit signs on the corridor next month,” he said. “As far as the speed limit goes,” he said, “our speed studies did indicate that 50 mph was the appropriate speed limit for the highway given current levels of congestion. The in basket: Andrew McMillen said in an e-mail, “When the Masi Shop on Highway 305 in Suquamish added the new buildings, they got an on/off merge lane in the southwest direction and an additional exit on the opposing side. “The speed limit is 55 mph and soon dropping to 50. However, in both directions traffic frequently has to slow to as low as 20 mph for exiting/entering traffic, sometimes abruptly. “Cars coming from the shop heading towards Poulsbo cause through traffic on the highway to slow drastically,” he said. “They don’t enter the merge lane and wait, they just merge all the way onto the highway, which is uphill at that point and slows them down. “What traffic studies were done on the highway modifications, or will be?” he asked. The out basket: I can’t answer that exact question, but the Suquamish tribe and the state are working to correct the shortcomings on that short stretch of highway. It’s clear the highway alignment has been a work in progress. Andrew referred me to a Google Maps aerial of that spot, presumable taken last year. 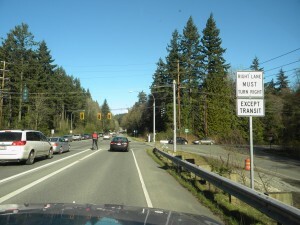 It showed two large arrows indicating a merge of traffic that has just turned left out of the shops to go toward Poulsbo and some left turn arrows for turns into the shops. Today. the two large arrows have been scrubbed off and the left turn lane is farther toward the center of the shopping complex. One of three egresses Google Maps showed is now closed and another enlarged. Bob Gatz, tribal engineer, says the tentative plans have not gotten final approval, but he expects the revised alignment to provide a deceleration lane for traffic from Poulsbo turning right into the shops. That should eliminate one of Andrew’s concerns. That will widen the highway and allow for a longer acceleration lane toward Poulsbo, Bob said. At present there isn’t enough length to let entering cars get up to highway speed before merging, so it will interesting to see if the changes will fix that. The center egress from the shops will remain closed and the one closest to Agate Passage will remain right-out-only, Bob said. Allowing left turns there would put cars into the left turn pocket, from which they could not proceed toward Poulsbo. The tribe’s Port Madison Enterprises, which runs the Masi Shop, Clearwater Casino, Kiana Lodge and a number of other things is paying for the work, state and tribal officials said. Incidentally, when I pronounced Masi like Masai, as in the African tribe, Russell Steele, head of Port Madison Enterprises corrected me and said it’s pronounced “mossy.” He didn’t know its meaning. The old store will soon be torn down, he said, but all the existing gas pumps will remain.